As part of our ongoing efforts to maintain basic information on our active members, please take a few minutes to provide us with your current contact information and answer a few questions. We are also considering funding opportunities for a transplant skin cancer registry. A knowledge of which transplant centers are associated with our members and a rough idea of how many transplant patients are being followed would be helpful in this process. Please provide us with these brief details regarding your transplant practice. Lastly, ITSCC would like to provide a venue in which to publicize member research and foster dialogue and possible collaboration. Please share a brief description of any current or planned projects which can be shared with the membership. 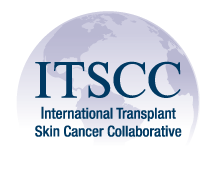 It's important that ITSCC remain relevant to your interest in transplant dermatology. In the final box, please provide any comments which might help us meet that goal. P.S. Please consider a gift to ITSCC; your tax-deductible donation supports the education and research of physicians and scientists committed to improving the quality of life of organ transplant recipients. Visit www.itscc.org or email info@itscc.org for details. Your designation(s) i.e. MD, PhD, etc. Which transplant center are you associated with? What is the nature of that association? Check all that apply. Clinical - Formal affiliation, work within the center, etc. Approximately how many organ transplant recipients do you follow? Approximately what percentage have skin cancer? Approximately how many NEW TO YOUR PRACTICE organ transplant recipients do you see each month? Are you seeing organ transplant recipients prior to the development of skin cancer for risk evaluation and education? If you have any ongoing research projects related to transplant dermatology, please describe each project below.